Rave reviews for the Cake at Barrington Stage Company! 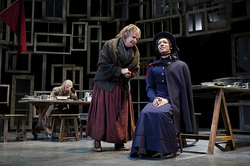 The New York Times: "Mostly, though, the play’s choices — and the lovely production, directed by Jennifer Chambers on Barrington’s smaller stage — cut against stereotypes, not going where you expect. (There’s no lawsuit.) In that way issues usually understood in legal terms become more personal matters of betrayal and accommodation. “The Cake” provides access to human questions at the heart of all change: How much time do we give people to “evolve”? How civil must we be while we wait?" Berkshire Bright Focus: "Nemuna Ceesay is a constant delight as she tears down walls, and barriers, exposing rust in the cakepan of life that Jen has always been comfortable in. She plays the harder, gruffer role, the woman you want to slap now and then as you say, "enough! Give it a rest!" She plays it so well, that when she undergoes her own metamorphosis the change is as delicious as the wedding cake Jen has been dreaming about." The Alt: "Ceesay is strong, upright in her love for Jen and belief in what’s right, her background having made her the woman she is today; the two young women interact so beautifully together and have such an honest, believable relationship." Berkshire On Stage: "Vale and Ceesay are excellent as the two brides whose commitment must be strong enough to override their divergent backgrounds and the powerful connection between Jen and Della." Nemuna is thrilled to spend part of her summer in the beautiful Berkshires playing the role of Macy in a production of Bekah Brunstetter's new hit play The Cake. ​PlayMakers Repertory Company has welcomed Nemuna into their 2017/2018 season! She is currently rehearsing the roles of Elmire in Tartuffe and the Pastor's Wife in The Christians. Nemuna is returning to OSF for a second season! This time she'll be playing with Shakespeare in HENRY IV PART 1 (2/22-10/28) and HENRY IV PART 2 (7/4-10/29) as Lady Percy/Ensemble! One of Nemuna's dreams has come true: she will be a part of the 2016 acting company at the Oregon Shakespeare Festival. Catch her from February 20, 2016-October 30, 2016 as Estella in GREAT EXPECTATIONS and Roxanne Rodriguez in ROE, a new American Revolutions Commission! ​Nemuna is appearing on Season 2 of the CBS show Madam Secretary. See her in Episode 214: "Left of the Boom" Watch until the end...that's where you'll catch her looking rather bloody and distressed! ​Nemuna is appearing on Season 3 of one of her favorite shows: Broad City! Check her out as "Beth" on Episode 4, coming 2016! Nemuna is making her Network Television Debut! Check back to see when you can catch her on the ABC show FOREVER playing the role of "Tech"
Nemuna is making her New York City Debut in the concert version of THE UNFORTUNATES at Joe's Pub at The Public playing the role of Rae. To learn more about the show and the concert click the button below! ​Nemuna's terrific summer at CalShakes has come to a close. Thank you to everyone who came out to support. The countdown begins to New York City! Nemuna lands the morning of AUGUST 5! Stay tuned for an update on representation and life in NY! "The Syracusan and Ephesan twins are being mistaken for each other at every turn, even by the local Anthipholus' wife...the terrific Nemuna Ceesay"
"And then there’s Nemuna Ceesay, fresh from her wonderful turn in Cal Shakes’ A Raisin in the Sun, as Adriana, a wife who is done with her husband’s shenanigans. I’ll always remember Ceesay’s performance fondly, not simply because she’s such a force on stage, but because in one of her forays into the audience on opening night, she interacted with male members of the audience and planted a big ol’ lipsticky kiss on my lips. As if the balmy June night wasn’t already warm enough, here’s a good example, kids, of how live theater can do things movies and TV never, ever could." "Nemuna Ceesay is a fiercely articulate Adriana"
"Despite being the scorned wife, Adriana remains full of chutzpah, an extremely likable foil to the goofy men surrounding her." Hopefully more good reviews to come! Come on over to The Bruns! ​Rave Reviews for A Raisin in the Sun at Calshakes! "Nemuna Ceesay lights up the stage as the sassy, intellectually omnivorous, outspoken college student Beneatha - whose dreams include not only her future as a doctor but also artistic self-expression, Africa and a mate who will treat her as an equal." ​Nemuna started rehearsals for A Raisin in the Sun at California Shakespeare Theater! Friday, March 21, 2014, 3p.m. Monday, March 24, 2014, at 2 p.m. & 7 p.m.
Monday, March 31, 2014, at 2 p.m. & 7 p.m.
Carly Cioffi at ccioffi@act-sf.org with any questions.